There are multiple factors that must align to see the successful transition from gold explorer to profitable developer and the junior gold company we have for you today, checks all the boxes. This Perth-based ASX junior has multiple highly prospective gold projects in one of the world’s great gold producing regions in the Democratic Republic of Congo (DRC). It has the right people, working on the right projects, at the right time. Depressed gold prices in recent years saw gold exploration abandoned by the majors, and highly prospective projects cast aside. There’s now been talk of peak global gold production occurring this year, meaning that gold prices could get a boost above their current US$1250/oz levels. This certainly bodes well for today’s junior as it works towards developing productive DRC gold operations. They are located adjacent to and within the famed Kibali Gold Project — a joint venture between global gold mining powerhouses A$12.2 billion-capped Randgold Resources (LON:RRS) and A$5.2 billion AngloGold Ashanti (JSE:ANG), plus SOKIMO. 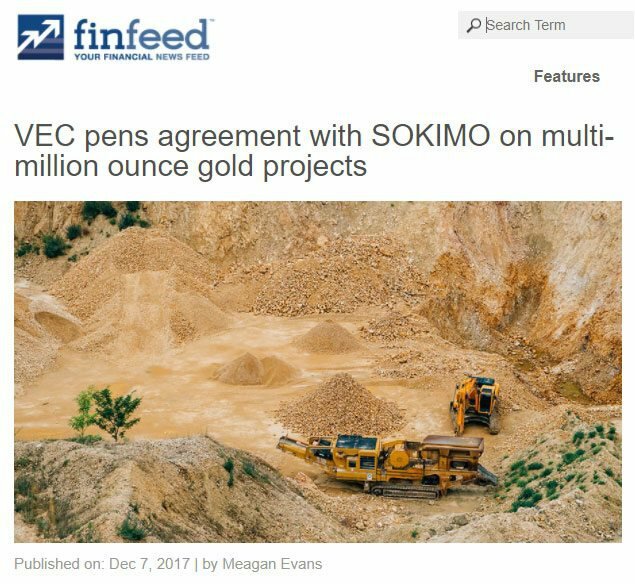 SOKIMO is also involved in the Heads of Agreement with Mongbwalu Gold Mines SA and Fimosa Capital Limited to establish a new joint venture for the proposed development of the world class Adidi-Kanga Gold Mine. The joint venture will give VEC a 60% interest in the project, with SOKIMO retaining a 13.78% interest. The Adidi-Kanga Gold Mine is already permitted for development, with Environmental and Social Impact Assessments completed and financial guarantees in place with the appropriate regulatory and administrative bodies in the DRC. VEC’s new transactions remain on schedule for completion in January and February 2018 and with money in the bank following a recent capital raising, the company is moving quickly to develop its assets as it looks to potentially transform itself from a junior explorer into a major gold company over the coming few years. 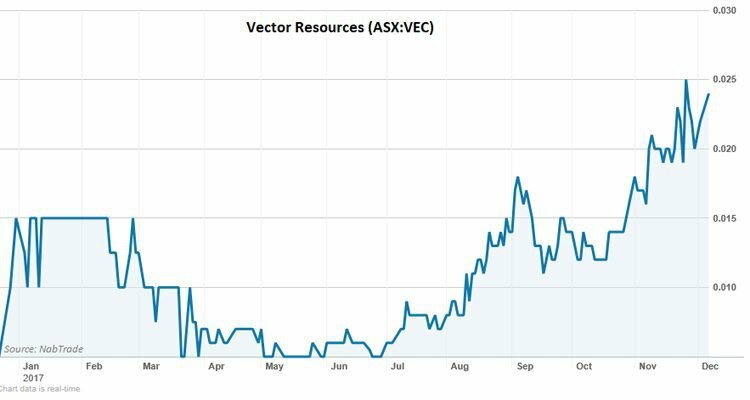 Perth-based Vector Resources (ASX:VEC) is strategically pursuing and exploring a number of highly prospective DRC gold mines. 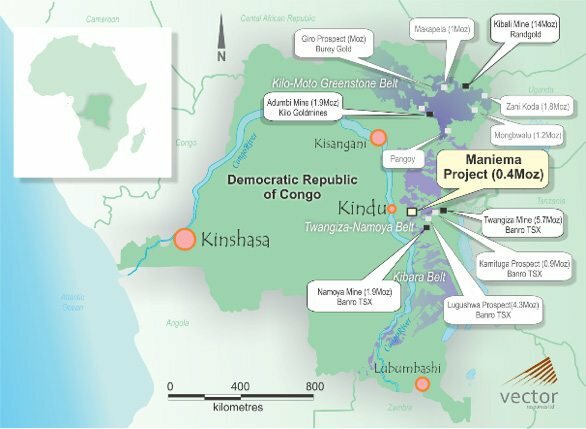 The company’s existing Maniema Gold Project was its first foray into DRC gold when it acquired a 70% interest in the project in December 2016. Investors were impressed with the company’s strategic decision, recognising the potential on offer. Now VEC has added to its DRC gold aspirations, signing HOAs for the exploration and development of two gold projects in north-eastern DRC and a Heads of Agreement with Mongbwalu Gold Mines and Fimosa Capital for VEC to obtain a 60 per cent interest in the world-class Adidi-Kanga Gold Mine, part of the Mongbwalu Gold Project, located in the Ituri Province of the DRC. The ongoing news flow has been cheered by investors, as reflected in the share price, which is up almost 400% over the past year. On December 7, VEC announced that it has signed two binding agreements to finalise joint venture agreements for its 100%-owned Kibali South and Nizi Gold Projects in the Ituri and Kilo Provinces of the Democratic Republic of Congo (DRC). 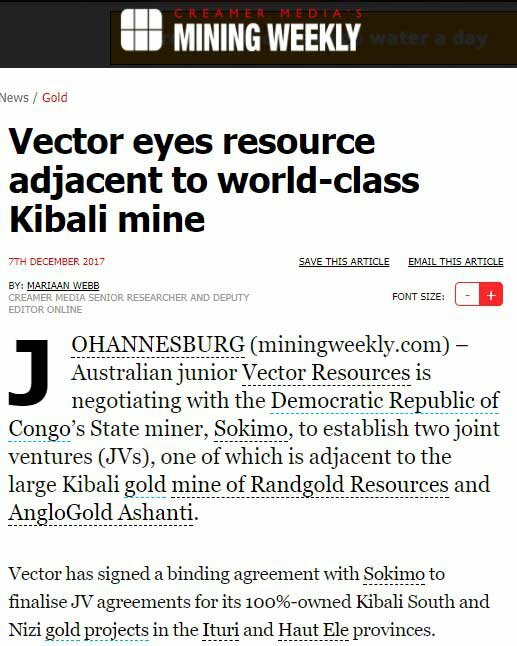 Under the agreements, with DRC state miner Société Minière de Kilo Moto (SOKIMO), VEC will finalise its due diligence and key terms for joint ventures for the exploration and development of the Kibali South and Nizi Gold Projects. 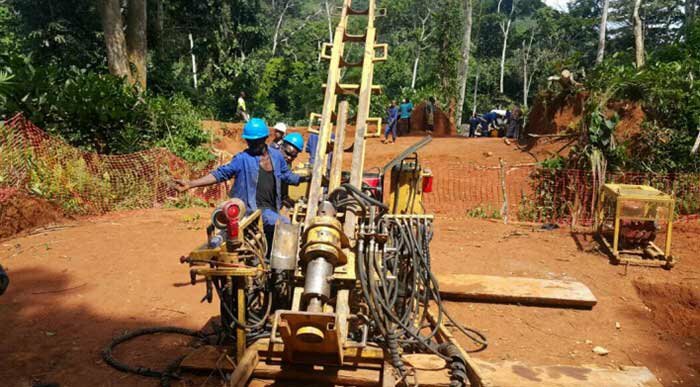 The Kibali South and Nizi Gold Joint Ventures with SOKIMO, located in the Ituri and Kilo Provinces in north-eastern DRC, are aimed at establishing a long-term partnership to build a major DRC focused gold mining company. VEC has 90 days to finalise legal, technical and financial due diligence in respect to the new JV and the two projects. It will utilise SOKIMO’s existing resources and capabilities to assist implementing and completing the exploration and feasibility study activities. VEC’s technical management and members of the Board have already completed a positive technical site visit and preliminary due diligence review and held successful meetings with SOKIMO to discuss ways to ensure a responsible and accelerated development timetable of the two gold projects. VEC was busy in December. Just before Christmas, it signed a HoA with Mongbwalu Gold Mines SA and Fimosa Capital Limited to look into a joint venture that would give it a 60% interest in the Adidi-Kanga Gold Mine. SOKIMO will retain a 13.78% interest in the Project through its interest in Adidi – Kanga NewCo and the 86.22% balance of Adidi – Kanga NewCo will be held by Fimosa and VEC through a company incorporated in the British Virgin Island. This world class project is situated in the Ituri Province of the DRC and is located on granted Mining License PE 5105, which is one of 13 licenses extending over 5,033km 2 that has already been the subject of extensive exploration activities by AngloGold Ashanti between 2005 and 2013. During this time, AngloGold Ashanti drilled over 432 RC holes for 52,994m and 572 diamond holes for 119,278m. Drilling was completed on a 25m x 50m spacing and up to a 200m x 200m spacing across the broader licenses area. AngloGold Ashanti reported several JORC (2004) compliant and SAMREC compliant Resources between 2010 and 2013 for the Project and completed a Feasibility Study on the proposed development of the Adidi – Kanga Mine as an open cut and underground. The SAMREC Mineral Resource for the Project has been calculated at 11.9Mt at an average grade of 7.65g/t of gold for 2.9 million ounces at a 2.8g/t cut-off. Of this, 5.4Mt at 7.64g/t for gold of 1.3 million ounces (2.8g/t cut-off) is in the Indicated Category and 6.5Mt at 7.65g/t for gold of 1.6 million ounces (2.8g/t cut-off) is in the Inferred Category. The Indicated Category is based on drill hole spacing of 25m x 50m and Inferred Category is based on spacing of 100m x 100m. The Company has not been provided with any more recent estimates or data that is relevant to the above SAMREC Mineral Resource. These estimates are not reported in line with the JORC (2012) Code. Given the historical data, VEC will seek to incorporate additional areas of mineralisation defined by previous wider spaced drilling by AngloGold Ashanti into a new JORC (2012) compliant resource. 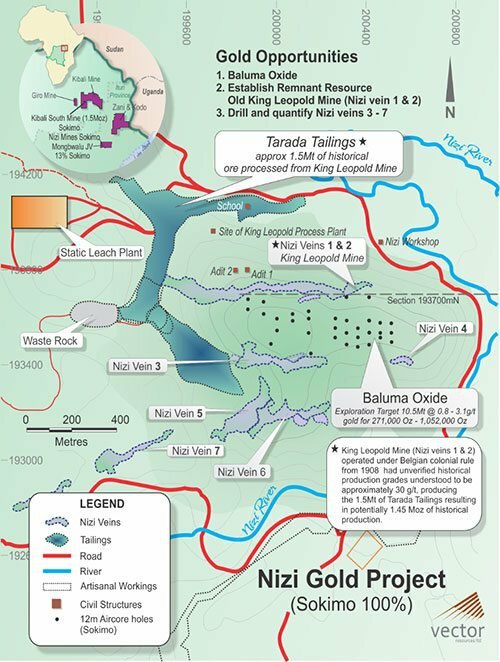 The company has also established an Exploration Target for the Project in addition to the SAMREC Mineral Resource for the Project of between 16 Mt and 27 Mt at an average grade range of 4.7g/t to 7.8 g/t of gold for 4.7 M oz s to 6.8 M ozs of contained gold in a zone extending up to 4km along strike with multiple shallow dipping veins and 400 – 600m in width. VEC’s proposed JV with SOKIMO on the Kibali South Gold Project is just 130km to the south – east and the Adidi-Kanga Gold Mine is also just 43km from VEC’s Nizi Gold Project. Under the terms of the HOA, VEC will work closely with its latest JV partner to establish and complete a Definitive Feasibility Study in 2018 for the development and commencement of gold mining activities at the Adidi – Kanga Gold Mine. The Kibali South Gold Project is the jewel in VEC’s crown. 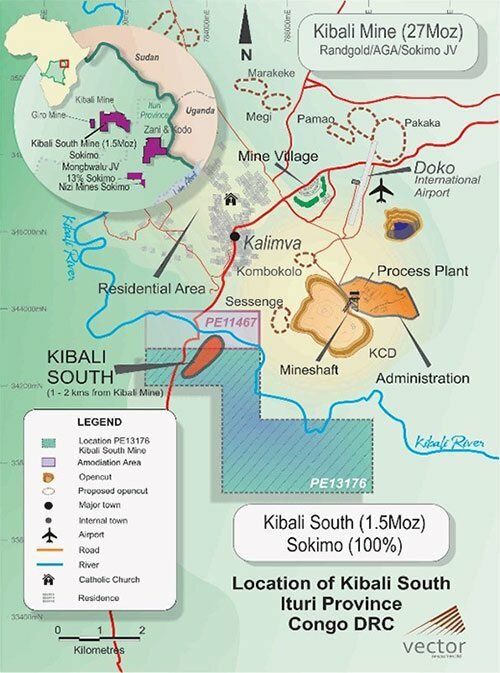 Located in the Moto goldfields of the northeast of DRC, Kibali South sits amongst the region’s gold action and is surrounded is by major global gold companies. It is situated on two permit areas, Mining Licenses PE13176 and PE11467, and is surrounded by ten Mining Licenses, that cover an area of 1836 square kilometres held by Kibali Goldmines — a joint venture between global gold mining powerhouses Randgold Resources Limited (45%), and AngloGold Ashanti (45%), plus Congolese group SOKIMO (10%). Kibali Goldmines operates Africa’s largest gold mining operation — Kibali Gold Mine. VEC’s Kibali South Gold Project is located immediately adjacent to the Kibali Gold Mine, as can be seen on the below map. 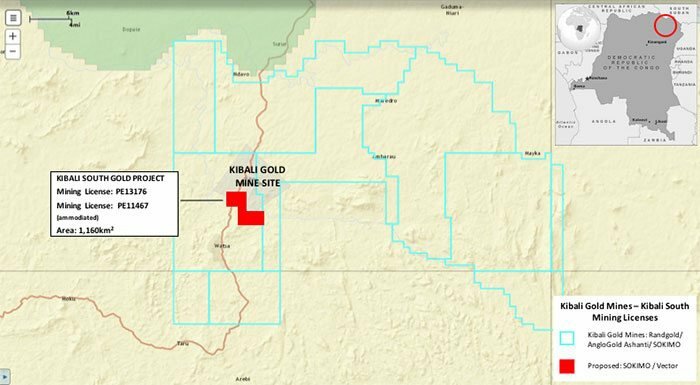 You can see the proposed VEC/SOKIMO project highlighted in red as well as the adjacent Kibali Gold Mine and Kibali Goldmines licenses’ borders outlined in blue. The Kibali Gold Mine is Africa’s largest gold producing mine. It was developed at a total capital cost of approximately US$2.5 billion, with currently over 27Mozs of gold resources and is operated by industry heavyweights Randgold Resources under joint venture with AngloGold Ashanti and SOKIMO. The Kibali Gold Mine is an integrated open pit and underground operation with twin declines, a vertical shaft and a 7.2Mtpa processing plant. The mine poured its first gold in September 2013 and in 2016 produced 585,946ozs, at total cash costs of US$736/oz. The Kibali South Gold Project is located within the Moto greenstone belt, which comprises Archean Kibalian System volcano-sedimentary rocks and ironstone-chert horizons that have been metamorphosed to greenschist facies. The gold at the Kibali Gold Project is hosted in a shear zone within volcanic agglomerates and basalts. This strikes northeast and dips between 30 to 40 degrees to the northwest over a strike length of approximately 1.6 kilometres with an average width of 300m and identified to a depth of 250m below surface. The resource estimation work completed by previous owners of the Kibali South Gold Project between 2009 and 2011 was assessed in 2014 by Coffey South Africa, a reputable global resource consultancy. VEC has completed a site visit to the Kibali South Gold Project and completed a preliminary technical due diligence that involved the review of various detailed technical information. It concluded that given the existing Resource, plus the size and nature of the mineralisation and the amodiation of the mineralisation from the Kibali Goldmines that Kibali South is capable of being ‘a stand-alone mine’. 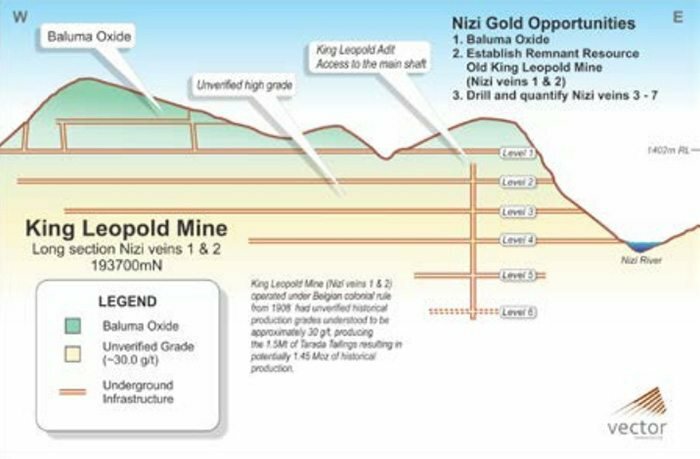 The Nizi Gold Project, which is located 120 kilometres south east of the Kibali South Gold Project, comprises several identified gold prospects including the Baluma Gold Oxide Project and King Leopold Gold Mine. The King Leopold mine was mined during Belgium colonial times and operated between 1908 and the 1960s. Historical production of up to 1.45Moz of gold is reported to have been produced from King Leopold during the 1900’s, at grades reported to be approximately 30g/t. The Baluma Gold Oxide Project, has been partially defined by SOKIMO through two SOKIMO drilling programs, Auger and RAB. These drill programs have defined potential oxide mineralisation. While the base data from these drilling programs isn’t yet available, the composite grades and drill hole collars has allowed for estimation of an initial Exploration Target of 10.5 Mt at a grade range of 0.8g/t to 3.1g/t for 271,000 oz. to 1,052,000 oz. The Maniema Gold Project is located in the Maniema Province in the world renowned and under explored Twangiza-Namoya Gold corridor. VEC’s 70% interest in the project was acquired in December 2016. Maniema comprises seven granted exploitation licences (PR4792, PR4801, PR4803, PR4804, PR4805, PR4806 and PR4812), which cover an area of over 500 square kilometres. It includes five main prospects; Kabotshome, Mbutu, Mitunda, Mbala and Tubambo that have been defined within the project area from previous exploration. The Kabotshome Gold Prospect is the most advanced of VEC’s and has a maiden Inferred Mineral Resource (JORC 2012) estimate of 7 million tonnes at 1.88g/t gold for 421,000 ounces of gold at the Kabotshome Gold Prospect, where gold mineralisation remains open along strike and at depth. On November 24, VEC reported on ongoing drilling at Maniema . The current drilling activities at the project are part of an initial 4000m drilling program, with the first six diamond holes part of an in-fill and extensional drilling program at the Kabotshome Gold Prospect. This drilling programme is an opportunity for VEC to fast-track its geological understanding of these prospects and potentially identify and progress further drilling targets. Extensions to the gold mineralisation at depth to the north and south of the Kabotshome Gold Prospect is planned. VEC will assess further drilling after these first six holes have been completed, as there are multiple new prospects available. These include the recently announced Eveche Gold Prospect and the Lukele Gold Prospect. 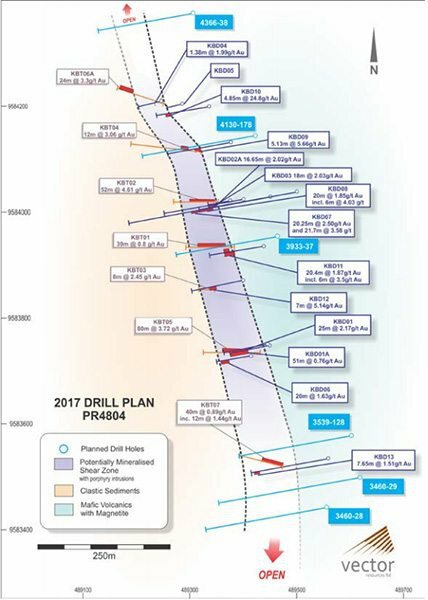 First results from the current drilling program expected to be received in the new year, with sample analyses being completed in the DRC and South Africa. VEC announced that as a result of its binding agreements with SOKIMO, it has received firm commitments for a A$3.24 million private placement to sophisticated investors. A total of 180 million new ordinary shares are proposed to be issued, at a price of 1.8 cents per share. The capital raising was oversubscribed and was not underwritten. The proceeds (after costs) will be used to fund up-front costs associated with advancing the Kibali South and Nizi/King Leopald Mine Joint venture. This includes finalisation of due diligence, legal documentation as well as ongoing due diligence on a further gold project acquisition that VEC is pursuing. It is early stages for DAV and investors should take a cautious approach to any investment decision made with regard to this stock. The gold price is currently at US$1250/oz. — at level at which it has been hovering for the past few years after having recovered from its late-2015 lows. However, at the recent Denver Gold Forum , the chairman of the World Gold Council, Randall Oliphant, asserted that gold production in 2017, ‘may be the most that will ever be produced’. 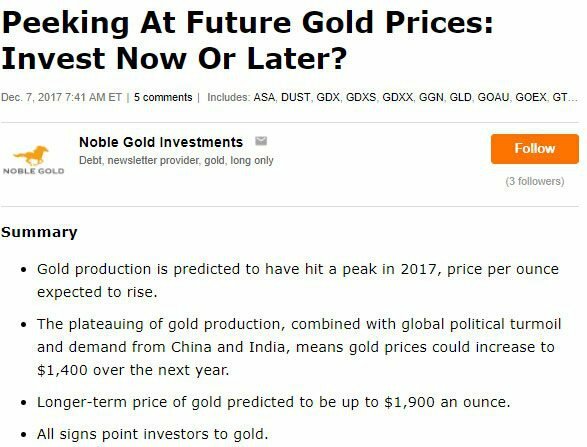 If global production from here does in fact plateau — or decline — we can expect a rise in the gold price above current levels. Some estimates point to a rise to US$1400/oz. over the next year. VEC’s ambitions are supported by a capable and experienced team. The company has both a strong corporate team with proven gold mine development and operating experience, as well as a highly experienced on ground team with extensive DRC and Africa experience, including at Moto Goldmines (Kibali Gold Mine). VEC has established an in-country geological and administration team and is securing the required technical capabilities for expansion and new project acquisitions as well as joint venture opportunities. Early investors in VEC can expect to see significant newsflow over the coming weeks and months, as the company accelerates its ambitions in this highly prospective region. There’s plenty of news still to come out of its 100% owned Kibali South and Nizi Gold Projects. All final due diligence and joint venture negotiations will be completed over the next 90 days, with the completion of all outstanding commercial terms and conditions to be satisfied. VEC’s accelerated targeting of DRC gold could prove be the catalyst for substantial long-term value creation.